Bankruptcy can be an incredibly difficult time for those in tough financial situations, and in many cases it has very little to do with how people handle their finances. Fortunately, bankruptcy law can help people get through and come out the other side ready to move on. However, it’s not something to be done alone. A bankruptcy attorney can ensure that your bankruptcy goes as smooth as possible. Here are some of the most common reasons people file for bankruptcy and seek the help of a bankruptcy lawyer. By far the reason that most people and families file for bankruptcy is because of medical expenses. Interestingly (and unfortunately), many of those who file had some form of insurance, so it’s not just the uninsured who can rack up thousands of dollars in medical bills. Losing a job affects people on so many levels. Not only are they being hit financially, but many of them are knocked for a loop emotionally. With less income, savings and severance are often drained quickly. Debts that were easily taken care of, including mortgages, are now debilitating. Divorce brings a host of expenses that many people don’t count on, including debts from your partner that you might not have even been aware of. There are also lawyers fees and a significant loss of income for one of the parties. Student loans can be debilitating and can haunt people for years, especially if the high-paying job they expected never materialized. Bankruptcy law can help those who are suffering from student loan debt. 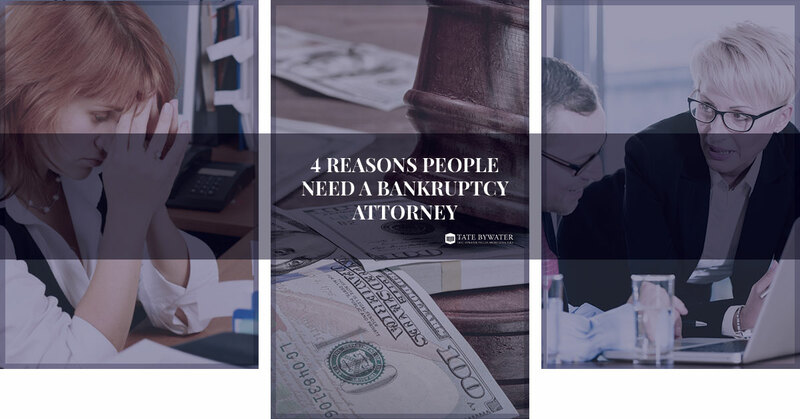 These are by no means the only people we see who come in looking for an experienced bankruptcy attorney. If you’re suffering financially and believe that bankruptcy could help, contact TATE BYWATER to discover your options.